In a joint statement, GU Energy Labs and Carmichael Training Systems today announced a 20-city author tour and ride-along series in support of Chris Carmichael's new book The Time-Crunched Cyclist. 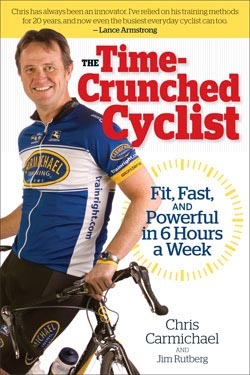 Chris Carmichael, the personal cycling coach to Lance Armstrong and the founder of Carmichael Training Systems, is the author of the newly-launched The Time-Crunched Cyclist: Fit, Fast, and Powerful in 6 Hours a Week. Carmichael's book presents a new way to achieve superior fitness and power, by leveraging busy athletes' limited time to unlock the power of high-intensity workouts and get fast in less time. This revolutionary new training plan is presented in a time-efficient method through detailed training plans, case studies, nutritional guidelines, and proven success stories. The Time-Crunched Training Program starts with the CTS Field Test, which is an established endurance, power and strength test used to assess a cyclist's initial personal training intensities. The book includes four detailed training plans and all associated workout instructions, strategies on how to properly fuel for these high-intensity or interval workouts, and tips on how to tweak riding style to capitalize on "time-crunched" fitness and power. The Time-Crunched Cyclist Tour Energized by GU will visit Philadelphia, NYC, Las Vegas, Los Angeles, Boston, Kona, Dallas, Houston, Austin, Phoenix, Tucson and the San Francisco Bay Area. Tour venues will include bicycle retailers, triathlon clubs and corporate appearances at Kaiser Permanente. For more information on locations, dates, and times, please visit trainright.com. GU Energy Labs, a staple in the cycling industry and the official nutrition supplier for Carmichael Training Systems, is a natural partner for such an energized tour. GU will provide samples and giveaways from its entire line of performance nutrition products, including the newly launched Chomps Energy Chews and GU Recovery Brew. GU president Brian Vaughan said, "I'm a time-crunched cyclist myself, but thanks to CTS, I was able to not only compete in the BC Bike Race and the Death Ride this July, I was able to do so at the peak of my abilities. I can personally attest to the incredible benefits of this program. We are proud to support Chris' initiative to make peak fitness a realistic goal for every cyclist who wants to improve their fitness and lifestyle." Chris Carmichael commented, "I'm really looking forward to this book tour, and talking to cyclists all around the country about the opportunities available for them in The Time-Crunched Cyclist. This is a new concept in endurance training that's going to make high-performance cycling accessible to athletes who have limited training time - like those of us balancing full-time jobs and families with our athletic ambitions. "I'm also very happy to have the support of GU Energy Labs. With 20 cities and rides connected to almost all the events in the tour, I'm going to need a lot of high-quality sports nutrition to see me through this tour successfully." The tour runs August of 2009 through January of 2010 with additional book signing appearances to occur in conjunction with the SoCal MS 150 Ride, the Philly Livestrong Ride and the Austin Livestrong Ride. For more information regarding The Time-Crunched Cyclist, please visit www.trainright.com. GU's original Energy Gel was launched in 1994 in Berkeley, CA. To this day, GU remains the market share leader and the premium gel available to endurance athletes, GU's product line is designed to provide athletes with scientifically-proven, performance-tested nutrition. For more information about GU, log onto www.GUenergy.com. Chris Carmichael was an Olympian and a professional cyclist before beginning his career as a coach, best-selling author, and entrepreneur. He has coached seven-time Tour de France Champion Lance Armstrong since 1990, was recognized as the U.S. Olympic Committee Coach of the Year, and was inducted into the U.S. Bicycling Hall of Fame in 2003. He founded Carmichael Training Systems (CTS) in 2000 to deliver personal coaching, training camps, and performance testing to athletes of all abilities. For more information, please visit trainright.com.